The method I’m about to outline owes a lot to a method proposed by Ben Schorr, a law firm technology consultant who’s now creating user education content at Microsoft. It involves several steps, so hang in there with me. Why do we need new Styles? So, where does this new List Style live? Define one or more Styles that contain the requisite paragraph formatting (spaces between paragraphs, etc.). We’re going to let the numbering scheme take care of the indentation and only embed into the Style(s) those elements that we can’t define within Define New Multilevel List. If you prefer to use any of the Heading Styles for any numbering levels, you can simply modify those, but I’ll show you how to create brand-new Styles for numbered paragraphs. Use Define New List Style to name our preferred numbering scheme and ensure that all future documents based on our Normal template (and any templates based off the Normal template) can access this numbering scheme. Within Define New List Style, go to the Define New Multilevel List dialog to define the numbering scheme and associate each level with our new Styles. Allow us to customize paragraph formatting (spacing between paragraphs, etc.) in ways we cannot within the Define New Multilevel List dialog (I’ve mentioned that already). Give our numbering scheme somewhat more formatting stability and flexibility. 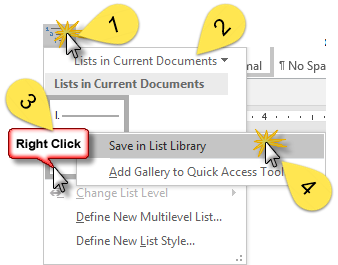 Associate the appropriate numbering levels with outline levels that can then be pulled automatically into a Table of Contents or viewed in the Navigation Pane, if either of those two functions is something the document needs. If one of those two goals isn’t relevant to you (say you’re only interested in making sure there’s an extra vertical space between your numbered paragraphs), then you can skip the relevant step (10 11 or 12) below accordingly. Steve noted, in his comment to a previous post, that he’d like to have extra inter-paragraph spacing built into his paragraph numbering scheme. Others want to be able to pull these items into their Table of Contents automatically, so those paragraph numbering Styles have to be linked to an Outline level. Let’s walk through it, and I’ll point out which steps are relevant to each scenario. The dialog box you’ll get after clicking Modify is the one shown on the left above. The instructions below correspond to the numbers above. First off, you’ll want to rename your paragraph numbering Style. Ben Schorr recommends the naming convention “Paranum#” where “#” corresponds to the numbering level. Sounds good to me. By default, you’ll probably find that Style type is “Linked”. You’ll want to change that to “Paragraph” to avoid having Word bring in any character-level formatting (fonts, etc.). That way, your numbering scheme won’t introduce new fonts into your document; it’ll simply pick up whatever font you’re already using. Because I recommended that you start this whole process with a blank document, Style based on is set to the Normal Style. If you’re adept enough with Styles to want to choose something else as a starting point, feel free. 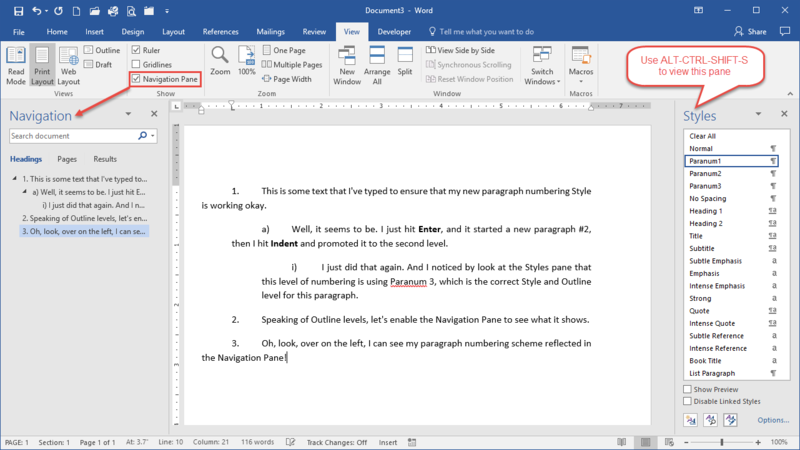 Style for following paragraph will default to the same name as your new Style. That way, when you press Enter, the next paragraph will continue the same numbering scheme at the same level, and you can promote/demote the levels as you learned earlier. Just for the sake of ensuring nothing funny goes on with fonts, I chose the current “Body” font, even though this is a Paragraph Style. That, admittedly, might have been superfluous. If you want to be able to see this Style in the Styles gallery on the Home tab, check this box. If that doesn’t matter to you, you can uncheck it. I would leave this unchecked if I were you. Otherwise, if you make any sort of formatting change within a paragraph that has this Style applied to it, you risk permanently altering the Style itself rather than just the selected text. If you want to be able to use this Style in New documents based on this template (for this example I’m in the Normal template), be sure this radio button is selected, because it isn’t by default. Now we’re going to set up the Paragraph formatting by clicking Format then Paragraph. Within the Paragraph dialog box (on the right in the above illustration), you’ve got some decisions to make. First, does this paragraph numbering level need to correspond to an outline level (say, for a heading or other text that needs to be part of a Table of Contents)? 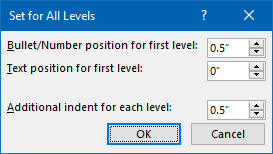 If so, use this Outline level drop-down to choose the corresponding level. If not, you can leave the value in Outline level as “Body text”. Do you want single spacing, a more relaxed spacing like 1.15, or something else? Choose the appropriate value for Line spacing here. Click OK to exit the Paragraph dialog box and return to the Create New Style from Formatting dialog box. And click OK again to finish. How many of these new Styles will you need? It depends on how many levels of numbering you want to use. To save a little time in creating levels 2-9, you can substitute the previous level’s Style name (ex: Paranum1) in Style based on (instead of “Normal”) in Step 3 above and only make necessary modifications to steps 4-14 (for example, changing the Outline level is Step 10). Choose New documents based on this template so this new List Style is saved in the Normal template (the default template I’m using now) for me to re-use whenever I want. I’ve now linked the first level of the multilevel list to one of my new paragraph numbering styles, Paranum1, which is linked to Outline level 1 in the Paragraph dialog box (see above). Because my basic paragraph numbering scheme is going to indent 1/2 inch progressively throughout, I’m going to take advantage of the Set for All Levels button to set all of the Position information automatically for each level. 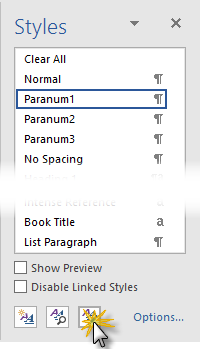 … link that level to the Style Paranum2, which in turn is linked to Outline level 2 in the Paragraph dialog box as demonstrated earlier. I make sure that Level 2 restarts its numbering after Level 1. … link that level to the Style Paranum3, which in turn is linked to Outline level 2 in the Paragraph dialog box as demonstrated earlier. Finally, I give this a ListNum field name. That’s totally optional, but can become important if you choose to use the ListNum field for any fancy cross-referencing work. The easiest way to find our new List Style is to use Sort order to organize the list By type. List Styles will be all the way at the bottom and will be signified by a bullet point icon to the left. Here’s our new Basic Paragraph Numbering Style! … or I can Delete it if I so choose. A walk-through of Heather’s example. A written downloadable resource per Adrian’s request. Any other questions? Let me have them in the comments below. Click here for the entire series.